On the 1st October i purchased a window from a ebay seller, due to the large distance he was from myself (350 miles) i arrange a courier to have the item collect, which the seller was happy with. The courier i decided to use was Parcel2Go (hermes light and large service), due to the high value of the item £500 i decide to pay a extra £14 to cover the £500.The collection was arranged for the 8th Oct but the collection never took place, i contact Parcel2Go which is a joke as they only appeat to allow a chat system, i was told they would rebook it for the 10th. This collection also failed and was told driver did not have van big enough , the nest collection was successfull and tracking got to around the 17th then stopped on the web site. I was now getting most concerned i decided to ring hermes direct, i got a better customer service and was told the item has been damaged and will be sent back to the sender, which of course is the ebay seller. I have contacted him and he has not seen any sign of it as of today. I have now had enough of waiting, do i have the right to put in a claim ? i noticed that parcel2go mention claims need to be put in 28 days from order. I would put a claim in now, for the full value of the item up to the £500 that you have paid the extra insurance for. As you've used parcel2go your claim will be with them and they will need to liase with hermes and sort it out. Even if they do find the item it's no longer usable if damaged so they should compensate you. 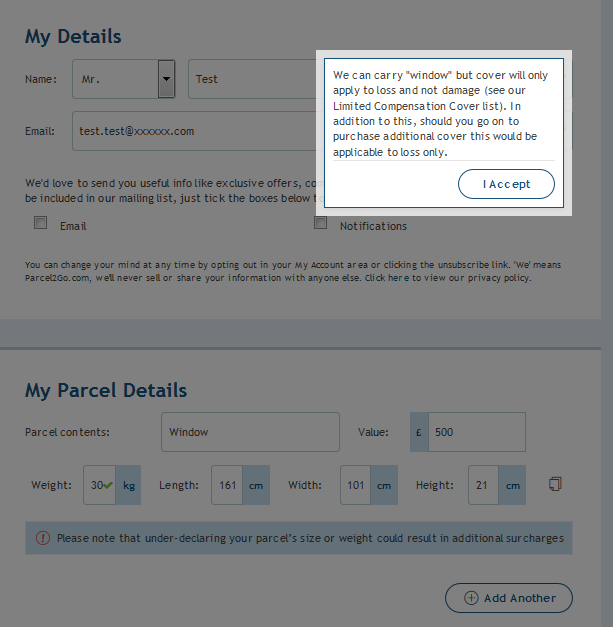 You are not alone in this, when I've tried to use parcel2go in the past for a collection nobody showed up either. And hermes are terrible for large or delicate items. Almost every large item I've ever had shipped with them was either returned to sender as damaged, or lost completely. Regarding parcel number: 89103xxxxxxxxxxx and sorry for the delay in response. Thank you for contacting myHermes. I'm sorry to see your parcels tracking hasn't updated since 18/10/2018 . The last tracking point was at the Hub but as millions of parcels go through the Hub a week, we can't arrange a specific sweep for your item. Weekly sweeps are carried out at the Hub so any parcel that is located is then scanned back in for delivery straight away. Just keep an eye on the tracking as we allow 5 days to make sure there has been enough time for it to be found and scanned back and as it has been more then 5 days we deem the parcel lost.As you have booked the parcel with Parcel2Go please contact them for further assistance on refund. Oh dear. You have used Parcel2Go. Once it is declared lost or damaged, all you will get back is the price you paid for the shipping as nearly everything sent by courier isn't covered by their restricted items list such as items containing glass. Other courier companies are the same. They will take your money and any extras to cover loss/damage and when you make a claim, they refer back to their terms and refuse to pay out. All is not lost. Parcel2Go accepted your parcel and you paid for the extra insurance so if they try to fob you off, you sue them. If you read other threads on here, you will see what has happened in other cases. Its a joke they can get away with this sort of thing, when you book the collection online you have to put the contents into one of the boxes which appears to indicate if its covered, i just run a test on it and a windows appeared to be covered for loss, knife being prohibited. , will await the excuse not to pay up, keep you posted. We’re writing to you in response to your recent enquiry regarding the following order: P2Gxxxxxxxx. We have conducted a full investigation with the courier to locate your parcel, unfortunately, in this instance, the search has proved unsuccessful. We apologise for the inconvenience this has caused and as a result, we have now progressed your enquiry to a claim. Our records show that you took out protection on your parcel for the declared value of its contents. That means that in the event that your claim is successful, you’ll get fully compensated for the declared value of your parcel. To help us progress your claim as quickly as possible, you’ll need to upload supporting documents. View your case to submit the required information. Sorry to hear you problem. I had a similar experience with them and they kept fobbing me off. Spoke to trading standards and sent them one last letter to get it sorted, when they didn't reply I started legal proceedings and they paid up. They will try and put barriers in your way hoping you will give up. Unfortunately your enquiry has been rejected. We’re very sorry to let you know that we were unable to approve your claim in this particular instance. During the booking process, we asked you to check your item against the list of items we’re unable to compensate for on our website. Unfortunately, the item you decided to send appears on our prohibited items and no-compensation list, which means we’re unable to compensate you for damages to this item. Time to start court proceedings i guess. Letter Before Action first. Give them 14 days to pay up then when they ignore this, on the 15th day file papers on the MCOL site. You can register with the site in advance. Companies like P2G don't want their terms and conditions questioned by a judge and they may just decide to settle. This has happened previously in other cases. Thanks for the link , i will now send letter before action and register on MCOL, will keep you posted. 14 days now passed, and no response from letter before action, i am now going to submit a claim on MCOL, have included my claim wording, should i also tick the box for include detailed particulars to defendant, or is the below enough ? The claimant paid the defendant £38.00 pounds on 1st October 2018 to carry out the collection and delivery of a Sash Window valued at £500.00 to my UK address. The cost of the delivery was £24.00. The claimant also paid £14.00 to the defendants as an insurance cover to protect themselves against the possible breach of their contract by the defendant. The defendants have lost the parcel and have admitted this. Despite this, they refuse to reimburse the claimant for the value of the parcel and cost of delivery. The claimant seeks £500.00 being the value of the lost Sash Window plus £38.00 for the insurance cover which the claimant now understands is unfair because the defendants were obligated to carry out the contract satisfactorily in any event and are responsible for losses incurred by their breach.
" should i also tick the box for include detailed particulars to defendant,"
No...also claim interest on the claim...section 69.... 8%....tick the box once your happy and ready to submit your particulars. We could do with some help from you. Hopefully thats all correct, "include detailed particulars" was not sure about.. Sorry, I have only just seen this. It all looks great of course and AndyOrch has signed it off. However, have you issued it? I would also have claimed for the insurance money as well. It's absurd to be required to pay insurance simply to protect yourself against somebody not carrying out their side of the contract. That's what the purchase price is for. You pay for a service to be done and to be complete and to be satisfactory. If there is a breach of contract then the purchase price is the consideration for the contract properly executed and if they fail to do so then they are liable. Otherwise they are saying – pay us the money and we will deliver your item but we won't be liable for breaches unless you pay us even more. By not claiming for the insurance premium as well, you are effectively validating the absurd culture that seems to have developed within the delivery industry. If you have issued the papers then fine – no problem. However, – and this is just my personal bugbear – I would advise you to claim back the insurance money as well if the papers have not yet been issued. Thanks for the advice, i have claimed for the insurance as well submitted 5 days ago. Please post up the claim form here in PDF format and when they defend, please post that up as well in PDF format. Received the following email from P2G. I am contacting you regarding the above Court proceedings. Firstly, please allow me to apologise for the problems caused when using our services. I would like to settle this for the full amount on the Court Papers which is £598.00. In order to settle the said amount can you please provide me with your sort code and account number, I will then set up a manual payment with our accounts department. Once the payment has been received can you then file a notice with the Court that this matter has been settled and no further action is needed. I assume i reply back with bank info and await to see if payment arrives ? Absolutely......well done.....once payment received..then inform the court its been settled. … and inform us as well please. Thanks, will not be withdrawing claim until money received, will let you know. Another one bites the dust. I assume it must be financially viable for P2G to pay out when they are challenged where most people will just accept their word for it when the case is rejected. It is people like you who challenge them and they will pay out to avoid court action. Full amount received, court informed that amount has been paid in full. Thanks for all your support, and hopefully people reading this post in the same position will also make a stand to these companies bad customer service. PPIPCM= 1174/6174*100=19% so anything you paid and when 19% was PPI on that payment date was this 1st loan paid off by another? Setting aside an email from a manager which is not contractually binding on the employer, do you have anything available to you that makes nominating you for an award a contractual term? Is there anything that says that you are contractually entitled to a financial payment- because there can't be an unauthorised deduction of something you aren't entitled to. You do not need to amend the ET1, if all you are saying is that this is another piece of evidence in respect of the claim you have already submitted. You amend to add claims. The ET1 is a summary of claim, not the absolute detail. So I can see no reason why you need to amend. That does not, of course, mean that it is evidence of anything either.